Hello, my friend from UK just recommended this lady who is letting go of her hobby Adana 8x5. I would like to check what I should be looking out for when purchasing. The current condition now is workable but one of the roller hooks is rather jam. As I am from Singapore, I won’t be able to check it personally. The photo below was sent by her. Thank you so much! This is a relatively old “Eight-Five”. It’s a Mk II machine, made between c.1955 and 1965, as evidenced by the main frame (cast in several pieces) and the roller arm hooks. The Mk III press (with a single-piece mainframe) was launched in 1965. I would want to check that the bearings aren’t showing signs of excessive wear (usually through lack of regular oiling) and that the impression is “firm” rather than “spongy”, which might indicate hairline fractures in the body castings. 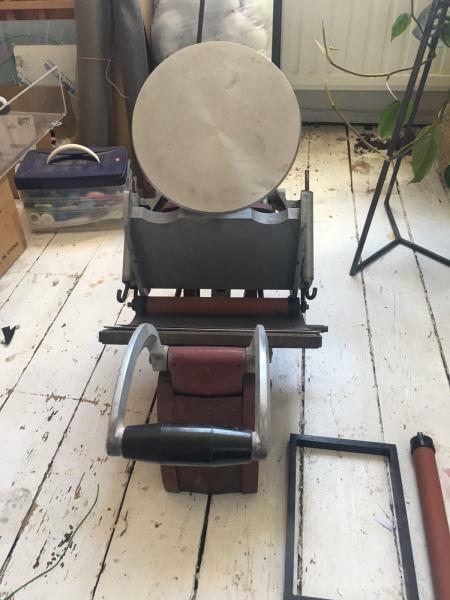 Buying a press at such a distance is always going to be a bit of a gamble, but if the seller has been using it recently it might be wise to ask for a few examples of recent work before committing to a firm purchase. As InkSprite wrote it is difficult to tell from one photograph, ask if they would send some more pictures. It may be that the roller hook shaft is bent, if so it can be straightened. Given it is an early model there could be some wear. A common place is the ink disk spindle which owners forget to oil and over time the disk becomes very loose and wobbles as the rollers move across it. Mk I split main frame, roller hooks and aluminium cover. MkIII one piece main frame, roller saddles? Bob, On behalf of the Potential buyer, Thank You. As You imply, that is along way to Ship and make a mistake, but the Actual machine is posted, right now on E bay No. under listing 132240007254, The Seller has achieved 100% positive feedback, the specification and description look to be synonymous with that kind of feedback, plus the general resume (Sellers own) appears to be, in good faith,! The bent Roller Arm is usually a fairly simple job to *true up*, providing and assuming the bend is, (as appears to be pictured) outwards of the sliding section of the Roller Arm frame, if the bend were on the Tail end, not so easy because even with the Split Pin out, the Hook can-not be withdrawn. Once withdrawn it is almost Childs Play to *true it up* which may have to be resorted to,? Adana Caslon do not appear to go, that far back. Thank you so much guys! Given that my country can no longer source for letterpress machine, I have to take a gamble to purchase it outside. I hope it is good to go! @InkSprite I will request for more information and probably more photos in a close-up shot. @platenprinter If the ink disk spindle is not oil over time, can it still be de-rust or repair? Will it affect the printing overall? @Mick Yeap I saw the Ebay posting too! Thank you for the info!